“Never Done” isn’t just a phrase to Tyler Coey. It’s his mantra, his brand, and his way of life. As an artist, he is always looking for ways to express himself and share his ideas and imagination. As a designer, he is always aiming to utilize space and put concepts to production. As a car guy, he is always striving to make his cars more bespoke and enjoyable. From an M Coupe with his own artwork on the hood, to an S50-swapped Alpina E30, Tyler’s ever-evolving collection of vehicles always feature his own crazy touches that take customization to the next level. 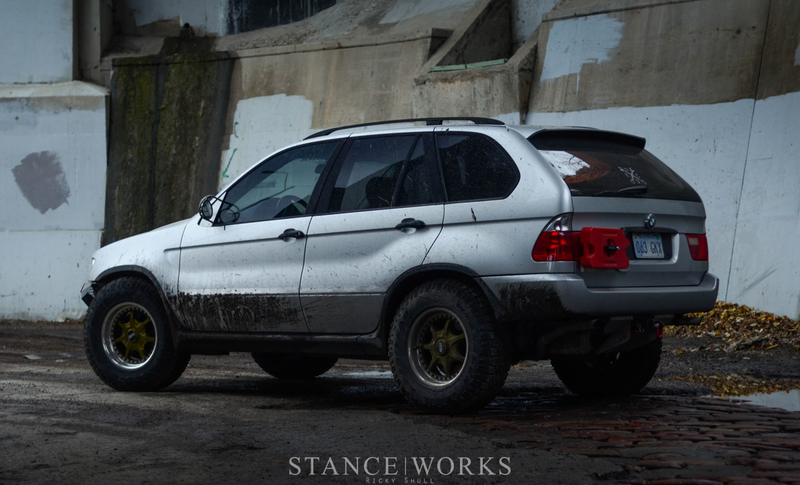 His X5 is no different, with looks that can kill and the functionality for an ultimate fun-having machine. 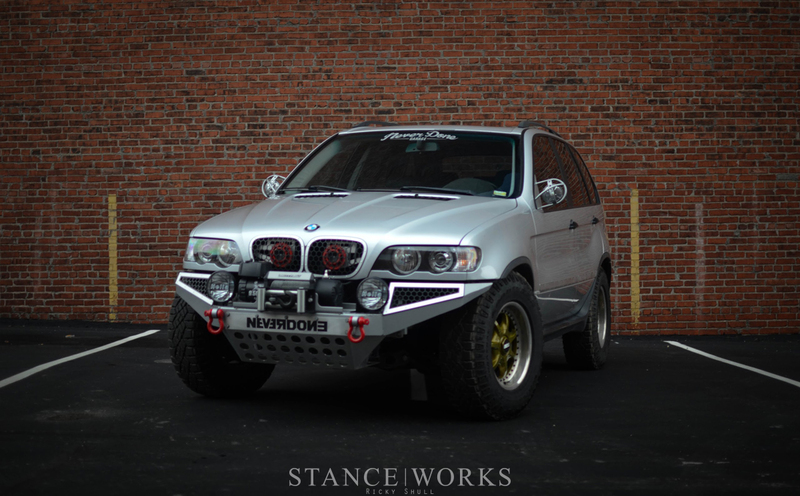 What started out as a necessity for something practical, Tyler bought the rare five-speed BMW X5 as a daily driver and art hauler. However, issues and gremlins arose thanks to the previous owner, and the new ride didn’t see much initial road time. 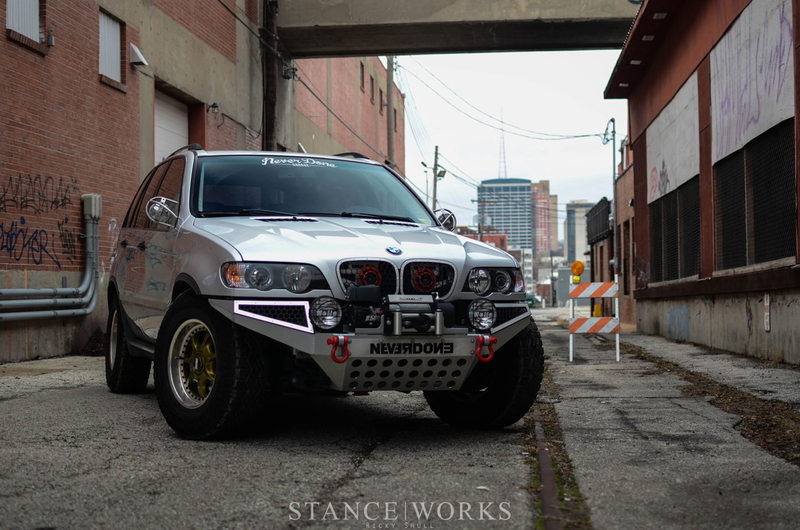 While the X5 was out of commission, Tyler’s artistic mind and knack for customization got his creative juices flowing with ideas for the SUV. 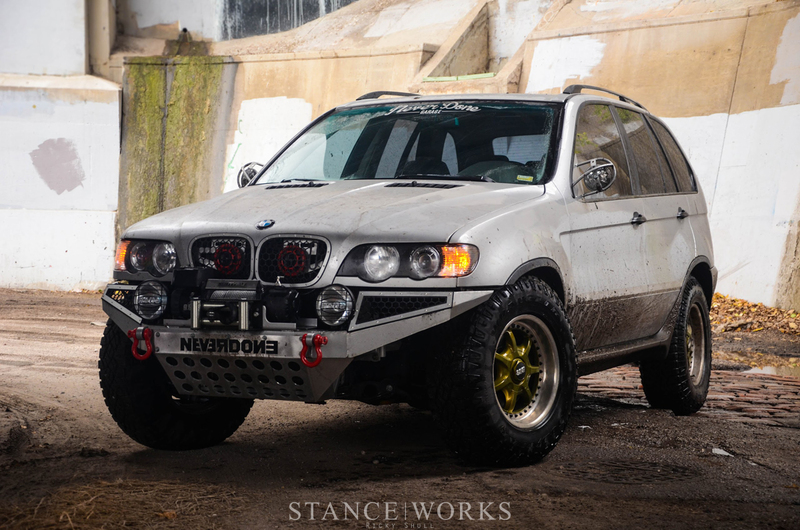 This resulted in his plans for an off-road capable vehicle, dubbed the BattleX. When Tyler started to tell me where he wanted to take the X5, I got excited. After seeing multiple phases of his beloved M Coupe and other BMWs he’s owned, I knew that the BattleX was going to be one wicked ride. First things first, Tyler knocked out the wheels and tires. 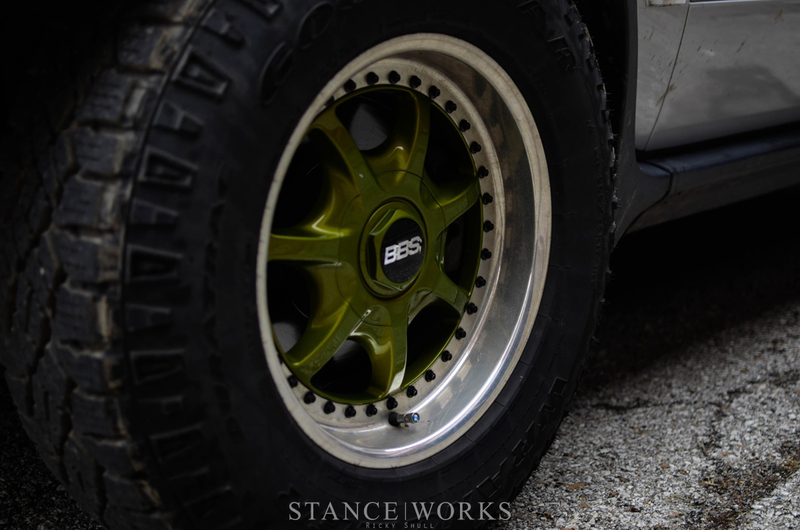 The X5 sits on a set of "Rescue Green" and mud-caked 17x8” BBS Style 19s with black bolts, and might just be the only set wrapped up in Goodyear All-Terrains. 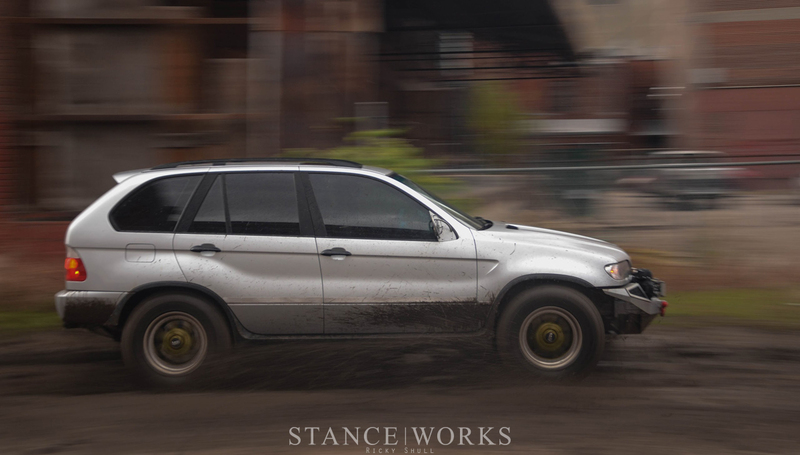 A 33-inch tire is far from conventional for an X5, especially one that is on stock suspension, but Tyler’s measurements turned out nearly impeccable and they fit with ease… plus a little cutting. 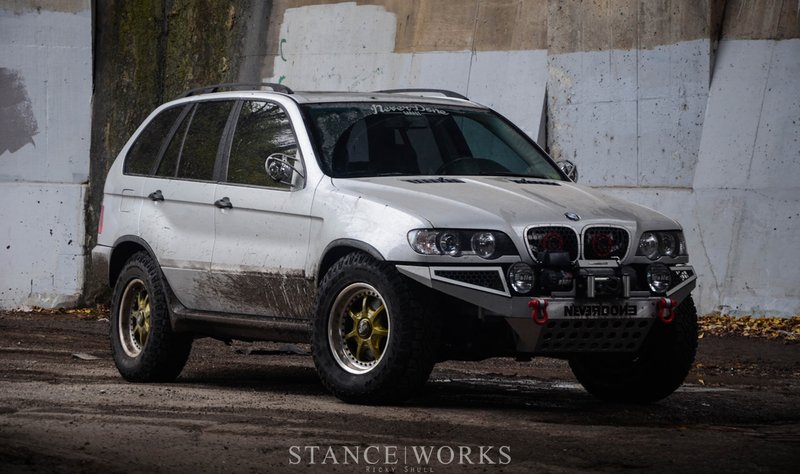 Since there is nothing that resembles an expansive off-road market for BMW SUVs, Tyler got creative and started designing parts for it under his brand, Never Done. 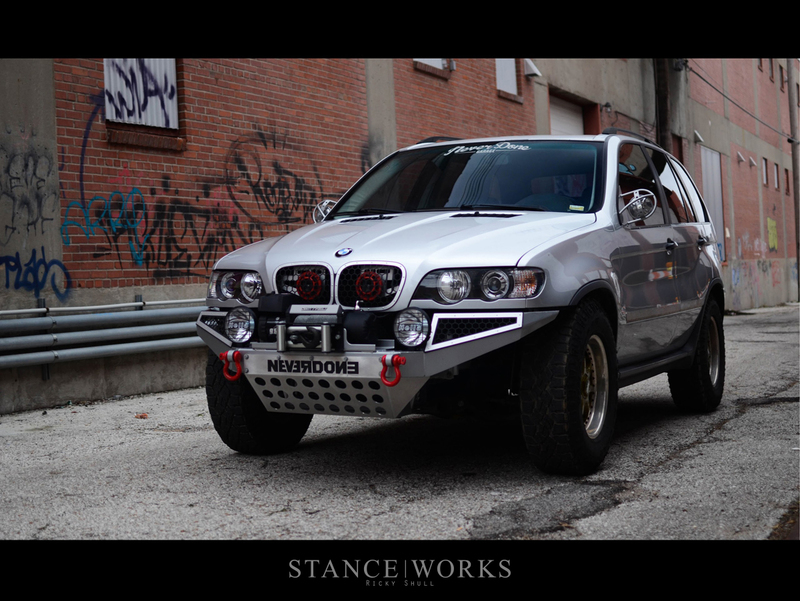 The front bumper came to be with his design skills and his friend Ryan Lawrence’s fabrication mastery. 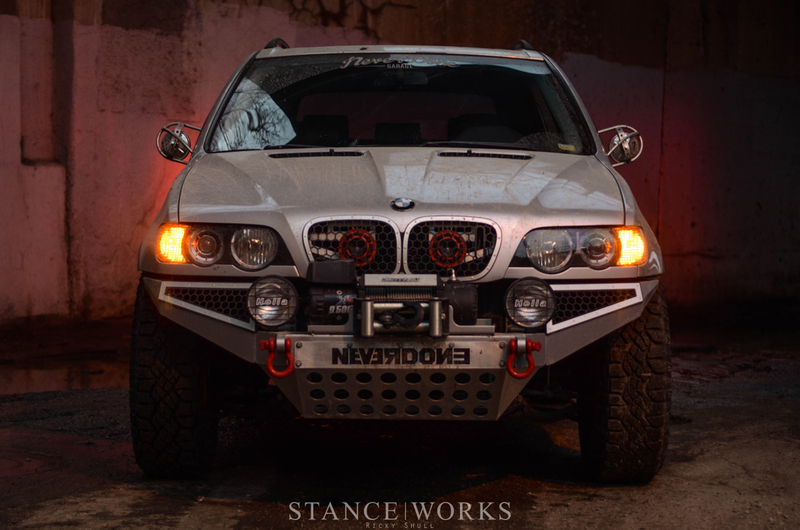 Cut and welded by Ryan, the powdercoated bumper gives the X5 a mean mug. Once it was installed on the BattleX, Hella fog lights and a Smitty Bilt winch were fitted. The “gills” on either side of the fogs are echoed in BMW’s famous kidney grill, where Tyler added his Never Done “Deep Breath” honeycomb variants. 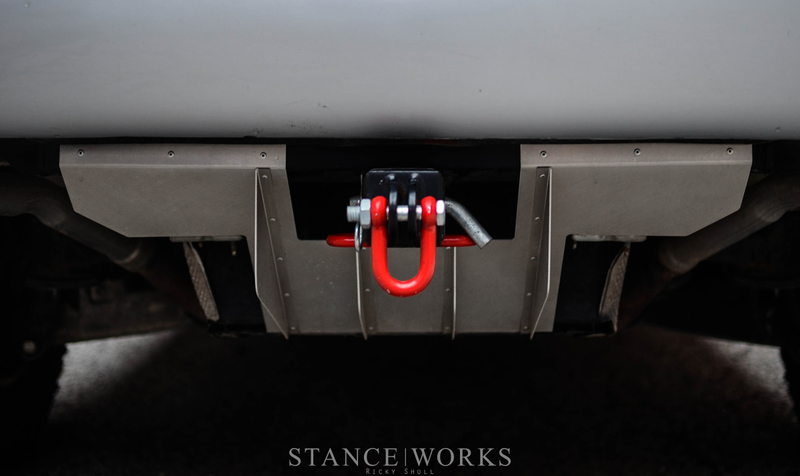 Behind the kidneys are a pair of Hella horns on a custom mount, and red tow hooks and a custom-cut skid plate add the final touches to the front end. Some of the subtle changes that Tyler has made are custom door moldings, and an E36 M3 steering wheel and shift knob, while projector beams and facelift lights modernize the car slightly. 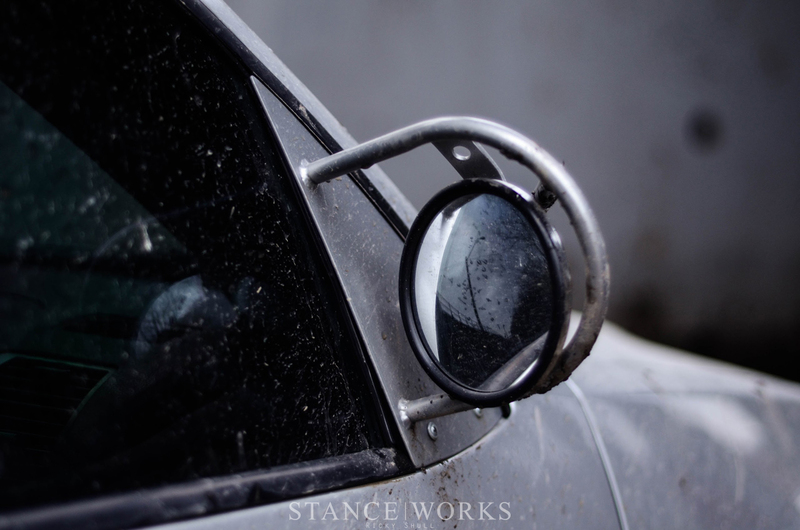 The mirrors are a unique feature created and fabricated by Ryan as well. 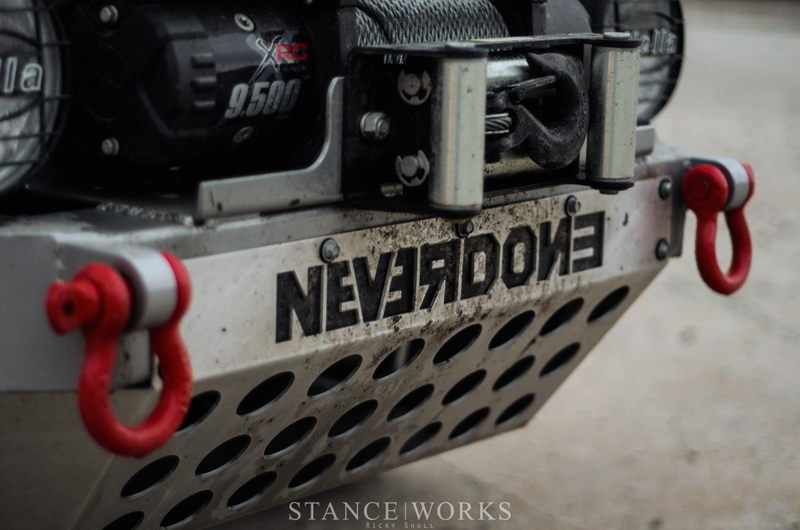 Just about everything that was custom built for this vehicle has been a product or prototype of Tyler and Ryan’s. They are very much the DIY-type of people, and with the “Never Done” mantra, both Ryan and Tyler take great pride in being able to innovate and create. 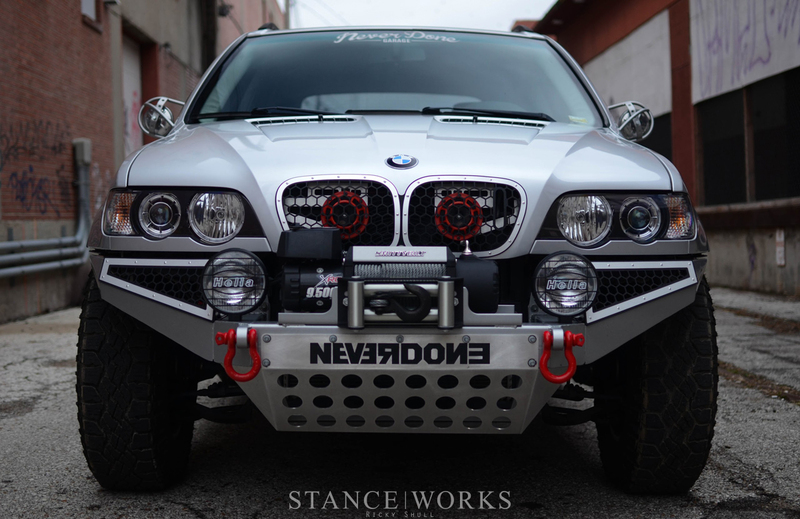 Never Done has a reputation with the M Coupe community for high-quality splitters and diffusers, and that same reputation for quality and creativity has transferred over to the BattleX. Most parts are designed to use the same mounting/drilling points for the stock counterparts, so it is easy to revert back to factory configuration. 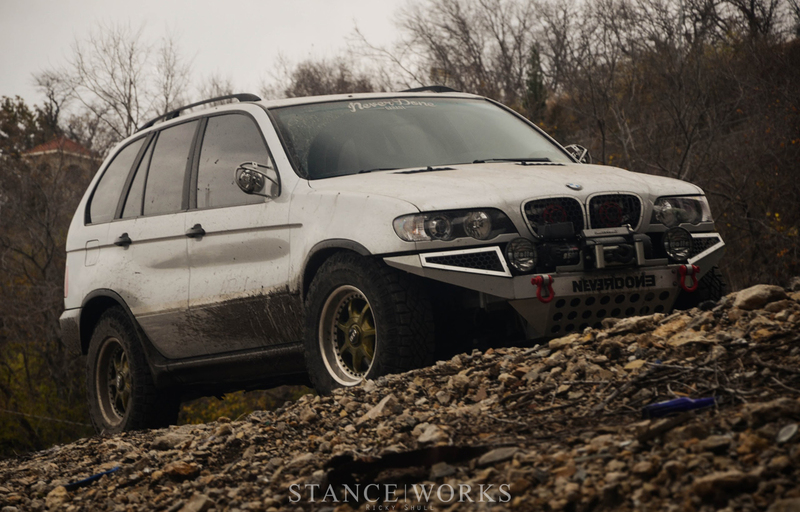 While at the time of this story the X5 sits on stock suspension, it is merely just going through one of the many phases that Tyler has in store for it. 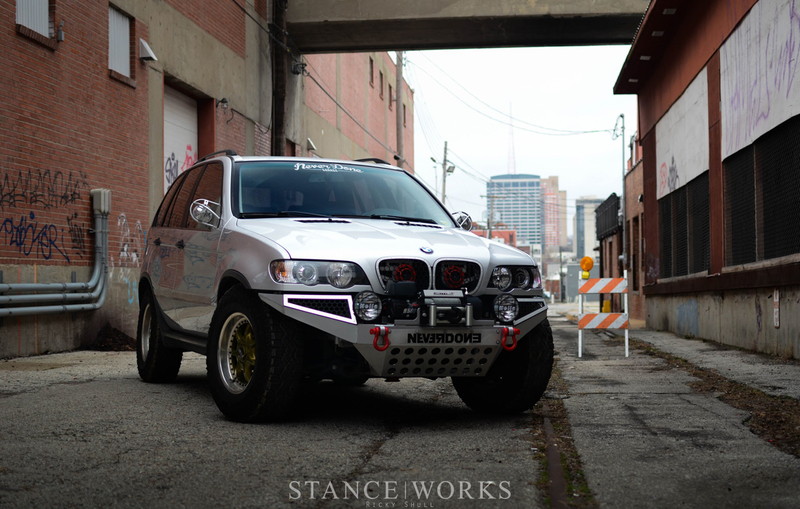 A three-inch lift kit awaits installation for the next phase, which will also include a bunch of new, custom pieces. Tyler is always moving, creating new things and improving on older designs. 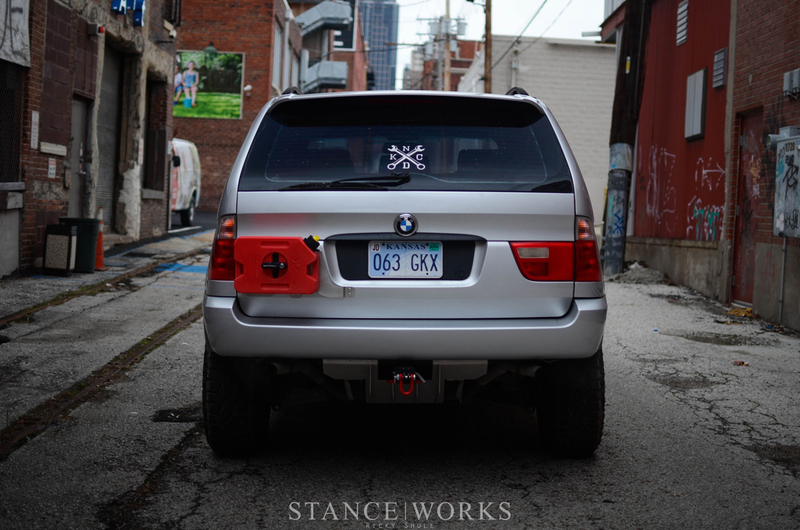 As he grows, the X5 will grow too. 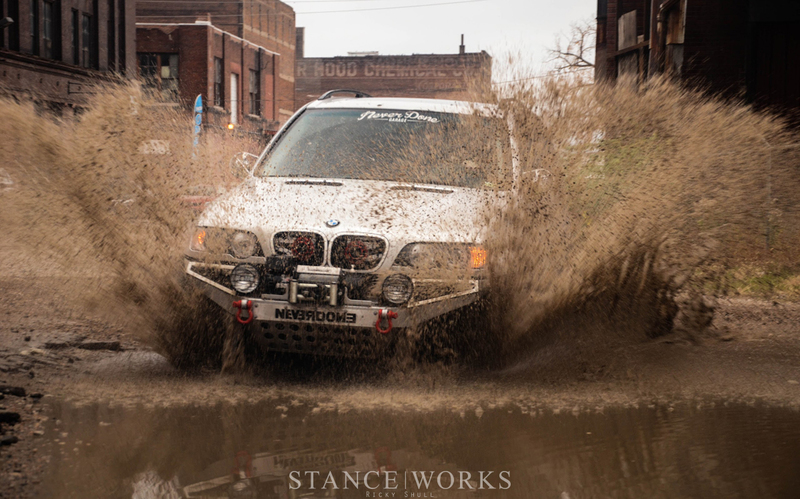 And while you may never see Tyler participate in the Dakar Rally, you can catch him exploring the urban off-road of Kansas City – enjoying his car as he should. 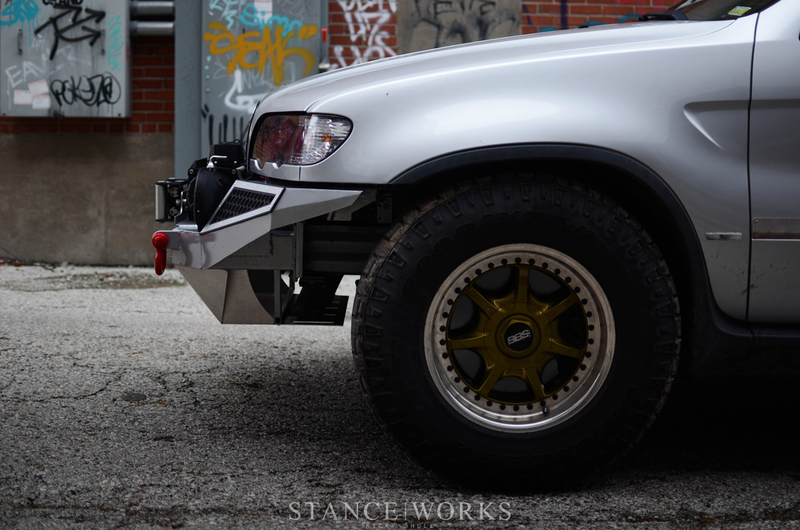 Is there a bumper that I can just buy and modify ?